This edition of the Bulletin deals mostly with the introduction of ISOM 2017 and the issues this creates for map management. We have included articles on the the introduction of ISOM 2017 and conversions, overprint settings for colours in OCAD, good practice for symbol numbering and the introduction of a possible ISOM 2017 conversion tool. We have posted before that the IOF has agreed on a new mapping specification for standard orienteering events and NZ has agreed that it will be optional during 2017, and in use from January 2018. What it means for orienteers is described on the ONZ website under Resources->Mapping . This strictly applies to A level events, but we’ll want to change frequently used maps too. Being realistic we would expect a mixture of old and new for the next few years, so we think that it’s important that maps and event information contain a clear statement of the specification which is used. Specifications in use are now ISOM 2000 (the old standard spec), ISOM 2017 (the new one), ISSOM 2007 (the sprint spec), the MTBO spec (with NZ variations) and the Ski-O spec. There are important differences between these specs about where the orienteer can and can’t go. In an ideal world, maps would be changed over by the time they are first used from January 2018. We have prepared for mappers a first guide to the conversion process. We don’t recommend you to go through a file and tweak the symbol definitions to convert it to ISOM 2017. The IOF has made extensive changes to symbol numbers and OCAD has come out with a new symbol table with extensive changes to colour numbers. Piecemeal changes to symbols will end up with a mish-mash of new and old. You should bring in OCAD’s new symbols and colours using a “cross-reference table” or CRT . This is simply a list of old-symbol-number against new-symbol-number. Please refer to our advice to mappers in the resources section of the ONZ website. This was prepared fairly quickly and won’t answer every question, so please ask the committee for further advice if required. We can make a second edition, post FAQs on the web, etc. Now a message to clubs. 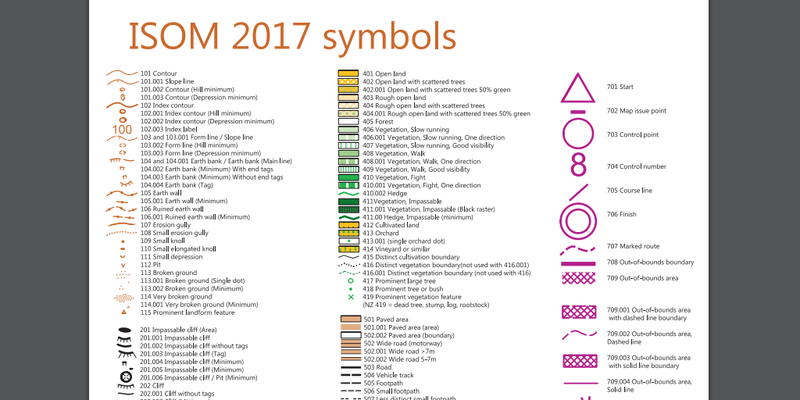 Conversion is easy for maps which comply with the symbols that OCAD provided us with for ISOM 2000. We suspect that such maps are in the minority, mainly those started from scratch very recently. Many maps use non-standard symbol sets “handed down” from early OCAD users. Many maps contain extra symbols, e.g. “Non-boundary fence which may be hidden on red courses” and they need to be thought about carefully. Many maps contain symbols which are smaller than standard, and on translation objects will enlarge and cause blurring. There can be quite a lot of work, much of it “under the skin”. It is important to do it for legibility and maintainability, just like servicing your car. Make sure your mappers are adequately rewarded for this work. Overprint Effect – A Hidden Demon? A non-obvious part of the OCAD colour tables is a switch for each colour called “Overprint”. If it is switched on for a colour, then that colour is modified according to any colours underneath. It simulates what happens in traditional offset printing, where ink goes onto the paper successively, and appropriate darkening can be good. It can also help certain detail show through the purple course markings, though one should not depend on it. The trouble is, the effect of “overprint” can be hidden at every stage of the process. In the normal view on your screen you can’t see it – only the top colour. In a PDF destined for one’s print service, it is only visible in Adobe Reader if you flick a switch in Edit->Preferences->Overprint Preview. And your print shop probably uses fancy workload management software which may or may not recognise “overprint” in the file. To cut to the chase, the standard colour table that OCAD has provided for many years has overprint switched on for blue. When overprint is on, blue over yellow gives green. The effect may lie dormant for years because of the previous paragraph. All of a sudden one club’s print service changed its management software and started recognising overprint – hey presto green streams. Any lazy drawing practices (not cutting holes for ponds etc.) lead to green ponds. Overlaps can lead to strange fringes round objects. OCAD has used the new ISOM 2017 symbols to revise its colour tables. It has taken the overprint off blue. It has advised that it will also take it off blue in the sprint spec, the MTBO spec and the Ski-O spec. And it has advised that it will take it off 50% black for passable walls in the sprint spec, which has similar problems over yellow and brown. Action required: None of this will feed into existing files, and if you’re not on the latest OCAD it won’t feed into your new files either. CHANGE YOUR COLOUR TABLES by removing the overprint tick for blue (all files) and 50% black (sprint files). Now the IOF has renumbered so many symbols, and OCAD has produced variations that it thinks are necessary, some of these new symbol numbers will have clobbered your beautiful 123.001. Don’t just push them A BIT further out (123.002) because we guarantee that OCAD hasn’t finished its new symbol set yet. (We’ve already asked for some missing ones!) Make your symbol variations WAY further out, e.g. 123.900. In fact you could do worse than look at Michael Wood’s numbering for his variations. Look for the red items in the table. With due acknowledgement to other mappers, he has a wide variety of symbols for special occasions, such as a second fence type that can be switched off for advanced courses. Additionally, Michael and Linley Earnshaw have developed a set of cartographers symbols intended never to be seen by the orienteer. See also on Michael’s website. They include lines traced from photos prior to field verification, notes and question-marks for the cartographer, objects being deleted which might possibly be needed again (e.g. overgrown tracks), GPS tracks, waypoints and labels, local body and landowner boundaries. Again the message is, use a set of numbers WELL CLEAR OF THE OCAD ONES. Michael’s hidden-symbol numbers have luckily escaped being clobbered by the recent changes. OCAD has come up with a “symbol conversion tool” in its latest OCAD 12 release. A preliminary view is that it could be OK for a one-off conversion of a file using a recent symbol set. Clubs will probably have a number of files to convert, with “similar but different” sets of symbols. It isn’t apparent how one could save the translation, modify it, and re-use it on the next file. It may be better to get used to using translation tables (CRT’s), since a successful CRT can be modified and reused without much extra work. Hints and other points of view would be welcomed by the Mapping Committee. The Mapping Bulletin, produced by the ONZ Mapping Committee. Subscribe to the Mapping Bulletin.